Small traditional “quinta” across Portugal commonly have a rabbit hatch to supply a meat treat for the family. This guarantees high quality home-bred rabbit meat which features in a number of traditional dishes. The most famous, “cabidela”, being a wet risotto to which rabbit blood mixed with vinegar is added towards the end of the cooking. This achieves an extremely rich, nutritious and contorting one pot meal. 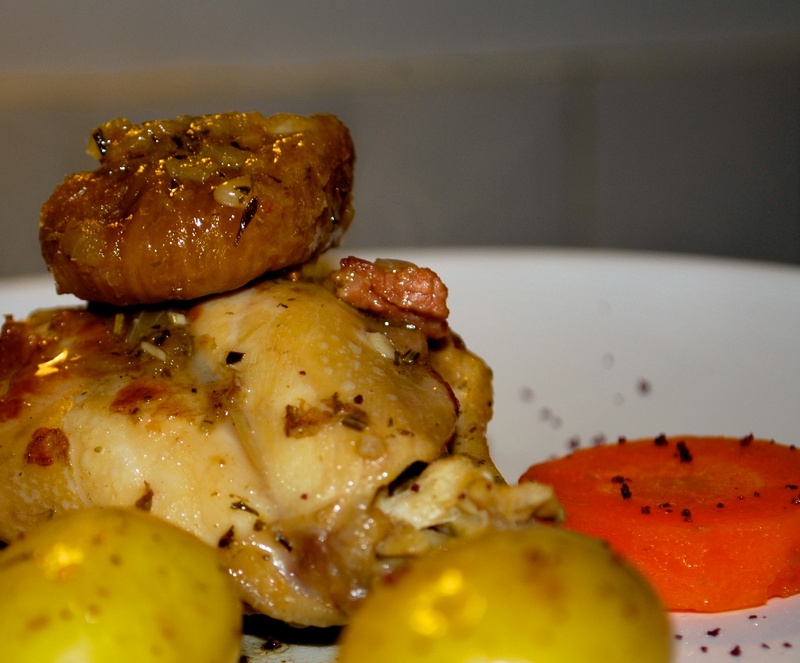 This recipe is a basic rabbit stew with a flavour twist provided by the sweet and complex aroma of dried figs. Rabbit has a relatively subtle flavour and the figs here add a layer of fruitiness which makes for a unique combination. As with all good stews, any left overs should be deboned and make it into small home made pies (empadas)! 1. Rinse the figs and soak in cold water for 10 minutes. 2. Joint the rabbit (or ask your butcher to do it) into individual portions (legs, thighs, chunks of saddle), lightly season with sea salt and pepper and set aside. 3. In a casserole or oven proof deep pan, fry the finely chopped onion until translucent then add the pancetta. Cook until fat from the pancetta is rendered and add garlic. Cook for another couple of minutes and then add the rabbit. With a wooden spoon mix so that all pieces of rabbit brown slightly. 4. Add the white, cook for a couple of minutes at high heat then add bouquet garni cover, the drained figs and put in a medium high oven. Cook for an hour mixing, occasionally. If the stew becomes dry, add more wine or a mix of wine and water. 5. Check seasoning and serve hot with, potatoes, white rice or polenta. This blog is a collection of personal recipes, tricks, techniques and thoughts relating to a Portuguese perspective on food. Portuguese food is not well known internationally and part of me wants to keep it that way. This blog represents the other part which intends to reflect a culinary tradition which by being fragile and in some ways lacking in identity is still interesting in comparison to the over formalised cuisines of France, Italy and Spain.